Click on the poster if you want to watch the trailer! Join us for Trailer Park Podcast 96! Are you ready for an epic virtual ride through the pop culture of your childhood in Ready Player One? We are and it's hard not to be excited about it, unless you're too young to recognize any of the references in which case that might be depressing, especially if you're a parent staring into your child's eyes slowly coming to the realization that they don't understand and would rather play on their ipad. Gringo is in the teeter position and has a bunch of awesome actors in it including David Oyelowo and F.L.A.T list member Charlize Theron. The fulcrum is Steven Soderbergh's first foray into horror. 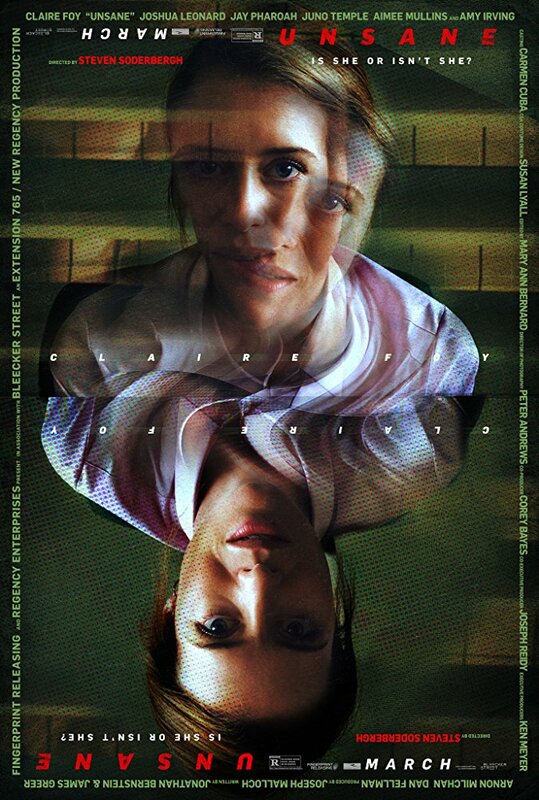 Unsane stars Claire Foy from The Crown as a girl who checks herself into a hospital after dealing with a stalker (who looks like The Intern) and ends up becoming committed. The trailer is a wild psychological ride and if the movie goes the distance, it could be a nice entry into the genre. Thoroughbreds is in the totter and has been doing the film festival circuit for some time and we look forward to it with great anticipation. The final film of Anton Yelchin has a bit too much quote persuasion for a trailer that sells you without it. Finally, in the five hole, Tomb Raider returns with a reboot starring Alicia Vikander. One might think that we would toss this video game movie aside and care very little about it. One might think that if they were obtuse and incapable of having fun in their lives. Stick around for the Roundtable and the Intern Corner.